If you have lived in the Lake Forest/Lake Bluff community for any amount of time, you know the excitement that the Lake Bluff 4th of July Parade generates. This parade, which attracts almost 25,000 people annually, is a well-loved tradition in our community. The Lake Bluff 4th of July Parade is solely funded each year by sponsorship, book advertisements, and private donations. These three arms of fundraising generate 100% of the parade funds, which are then used to pay parade entrants (marching bands and entertainment units), for parade day equipment (sound, stage, and live internet streaming), and marketing efforts. Have time to donate? The parade committee is run strictly by volunteers. Become a volunteer below! Would you or your family like to support the celebration? In order to cover our costs, the parade committee solicits local businesses to place ads in our parade book. This book, a collection of local stories, parade day information and advertisements, is delivered to all residences in Lake Bluff and Knollwood. Your dollars really do make a difference, by allowing us to bring in amazing marching bands, great entertainment units and cover other miscellaneous parade day expenses. The book consists of four-color full page, half page and quarter page ads. Examples of past parade books can be found in the History section of our website. This year, the book ad deadline is April 25, 2018. Feel like your company could help us in a larger capacity? See below for sponsor opportunities. This past Fourth of July Parade was a great success and huge value to those companies that decided to sponsor the parade. Our past sponsors enjoyed many months of quality advertising and promotion both prior to and during the parade. It is a unique marketing opportunity that you will not regret. Reaching an audience of almost 25,000 people on parade day, comprised of residents from Lake Bluff, Lake Forest and other surrounding communities. Listed as a sponsor in our Parade Book, which is circulated to all residences in the Lake Bluff and Knollwodd communities. Featured on our Website from Spring 2019 to Spring 2020. Prominently displayed via signage on our parade day stage. Highlighted by our Master of Ceremonies and broadcast on our live Internet stream, which is seen by viewers in Alabama, Arizona, California, Florida, Kansas, Kentucky, Maryland, North Carolina, Utah and the foreign countries of Spain and Panama. Click here to view or download the 2019 Sponsorship Packages. Thank you for sponsoring the Lake Bluff 4th of July Parade! 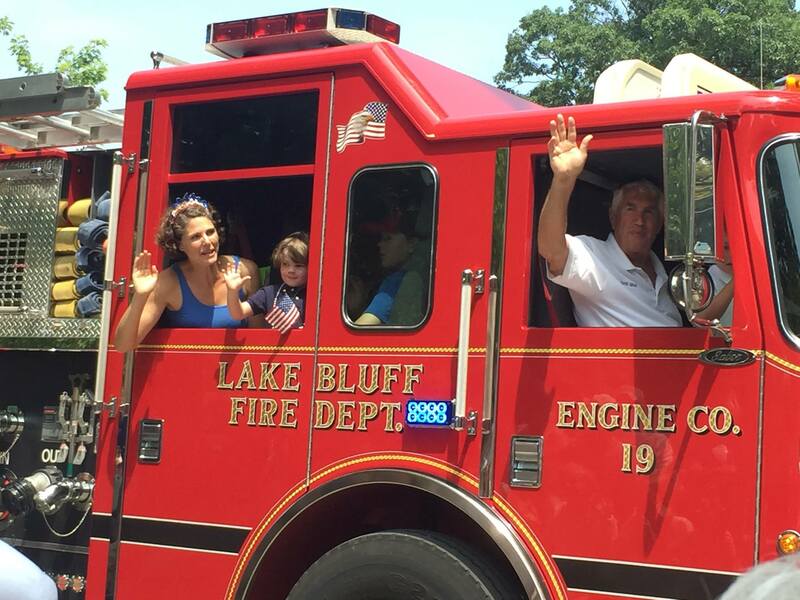 The Lake Bluff 4th of July Committee is the non-profit organization that hosts more than 25,000 people annually for the Lake Bluff 4th of July Parade. The all-volunteer committee begins the parade planning, organizing and fundraising process each September. The planning and running of the parade is no small feat and there is always a need for more volunteers. Participate in the monthly meetings throughout the year (July and August are usually excluded). Help make decisions about the parade. Lend expertise in areas of knowledge or interest. Committee officer roles include president, vice president, secretary and treasurer. Committee board roles include logistics, sponsorship, fundraising and book production, communications and social media, information technology, parade content and VIP management. Involved with running the parade on the 4th of July. Responsibilities can include parade unit check-in, helping manage VIPs at the parade stage, directing parade units to their line-up position and general parade-day logistics. In the past, church, civic and service organization groups have volunteered together on parade day, which makes the day even more fun! If you have an interest in volunteering or learning more about our different volunteer opportunities, please contact us at info@LB4July.org. Would you like to support us by being in the parade? Join us!